Troubling with IPsec-based legacy VPN products? Replace it to SoftEther VPN. SoftEther VPN Protocol is based on HTTPS so almost all kinds of firewalls permits SoftEther VPN's packets. You might have an experience that you cannot use IPsec-based legacy VPN protocols from a hotel room or Wi-Fi. The reason is simple. 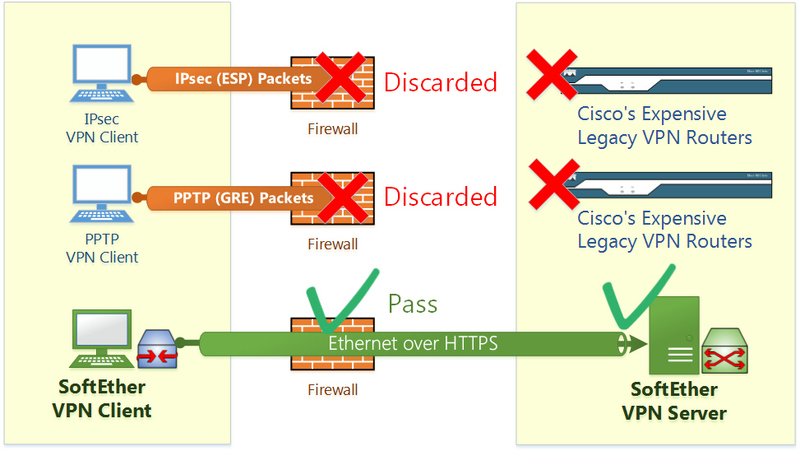 The firewalls of public networks often filters IPsec VPN protocols. Unlike legacy VPNs, SoftEther VPN is based on SSL-VPN. It is technically HTTPS (HTTP over SSL). HTTPS can pass any kinds of firewalls which disallow IPsec-based VPNs.